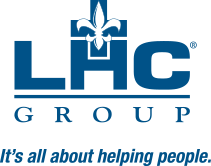 Based in Lafayette, Louisiana, LHC Group is a leading national provider of in-home healthcare services with 32,000 employees operating in 35 states – reaching 60 percent of the U.S. population aged 65 and older. We provide high-quality care to patients through our home health, hospice, home and community based services, and facility-based care. LHC Group is the preferred in-home healthcare partner for 340 leading hospitals around the country. Working with our hospital and health system partners, we help seamlessly transition patients from the acute to the post-acute setting – bringing a patient-centered continuum of care to the communities we serve together, reducing avoidable readmissions, improving clinical outcomes, and enhancing operational performance. Our company was founded in 1994 as a single home health agency in small-town America, with a mission to serve the neediest and most vulnerable members of the community. Those values and priorities still form the core of our company culture. Our focus is on moving our industry forward. We encourage and nurture a culture of innovation, and we are determined to lead our industry and our peers in finding ways to adapt, overcome obstacles, and improve service in a healthcare system that is always changing. We will improve the quality of life in the United States by transforming the delivery of healthcare services. Hear how LHC Group has grown to serve post-acute healthcare needs across the country.